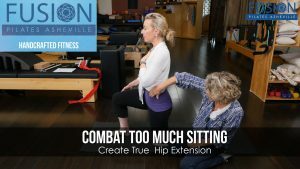 Join Dorene from Fusion Pilates Asheville for a quick Pilates tip on how to separate the pelvis from the leg to combat the time spent in hip flexion. 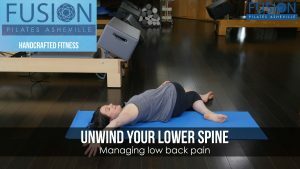 Join Amy from Fusion Pilates Asheville for a quick Pilates tip on how to keep your low back happy and healthy. Join Alice Jane from Fusion Pilates Asheville for a quick Pilates tip on how to help your posture on road trips. 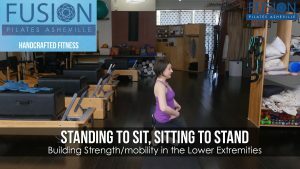 Join Amy from Fusion Pilates Asheville for a quick Pilates tip on taking the Pilates single leg kick to a new level. Join Cass from Fusion Pilates Asheville for a quick Pilates tip on how to improve scapular [shoulder blade] muscle strength. Join Amy from Fusion Pilates Asheville for a quick Pilates tip on how stretch the (inner leg) adductor muscles. Join Dorene from Fusion Pilates Asheville for a quick Pilates tip on how prop yourself just like in the first version of Neutral Ribs and then use something like a roller, a stick, a 2 x 4 to get your arms to move and bear weight without moving the ribs.